There are mixed opinions on animal testing for products, medications and treatments that are meant to benefit humans or be consumed by humans in some format. Yet have you ever considered animal testing being used to create and assess pet foods? The concept seems like an unusual and foreign one. In fact, it can seem so unlikely that many of us might assume that animal testing does not occur for pet foods. Actually, there are some manufacturers of pet food that do routinely use animal testing to formulate their products and ensure that they are nutritionally complete and safe. It is an area that is largely ignored, perhaps because most people simply expect that animal testing would not occur in this field. The animal food industry is an enormous one that is continually increasing in size. A number of large corporations dominate the pet food industry. In fact, several conduct routine testing on animals, which satisfies their aim to obtain a more competitive edge in the market. Supermarkets will sell all of these products, whether they have been tested on animals or whether the pet food manufacturer has boycotted the practice of animal testing. There are some members of the public who have cited that it would be ideal and helpful to the cause if grocery stores could boycott any pet food brands that are known animal testers. The belief is that by preventing the public from purchasing while also increasing awareness about the practice of animal testing, then more animal lives can be saved and there will be substantially less animal suffering due to animal testing. Still, if you do not support animal testing and similar methods of research, plus you want to ensure that your beloved family pet is not consuming products that were tested on other animals – including dogs – then you can check labels and contact pet food manufacturers to find out if their products have been tested on animals. Also keep in mind that not all manufacturers use animal testing to the same extent and purpose. This means that one company may test on animals right through to the final product while another may only use animals to assess the palatability and appeal of the product for that market of dogs, cats or other animals. 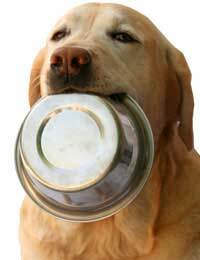 Pet foods are a booming business and despite some manufacturers of pet food having boycotted the practice of animal testing, others continue to use animals to help them conduct research, gain a competitive edge and confirm product safety. There are alternatives to testing on animals but not all companies see these as viable and cost-effective. Those who do use alternatives usually tend to be committed to reducing or omitting all tests on animals for the manufacturing of their pet foods. It is very much a personal choice whether you want to purchase a pet food that has not been tested on animals, or if you are apathetic to animal testing procedures for pet foods. Whatever choice you make, the best choice will be an informed one.